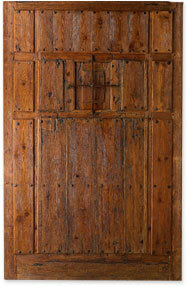 Portera invites you to discover the largest collection of antique Spanish doors the world has to offer. Each antique door has been hand restored by old-world Spanish craftsmen, carefully preserving its architectural integrity. A time-honored tradition practiced by few. Every door, a piece of history. The Door of 1,000 Stars - a 16th-Century Mudéjar portal studded with étoile nails. A 15th-Century Andalusian convent door that endured the Spanish Inquisition. An 18th-Century arched portal from a village on the route of the Santiago de Compostela pilgrimage. Each door has a story. Let us help you find the door that complements your design. Portera works with clients internationally. Our design teams work with you to identify a selection of doors that compliment your project. To facilitate the selection process, we provide a high-resolution portfolio of images sent via email. Once selected, Portera can help facilitate your shipping needs.